Chuck Loeb’s legacy archive is a truly comprehensive video library with hundreds of jazz guitar lessons. Students have unlimited access to online guitar lessons as well as tablature and backing tracks. Learn how to play the guitar from the late jazz legend. What makes these jazz guitar lessons truly unique is that this is the only place online preserving the playing and teaching legacy of the late, great Chuck Loeb through the library of videos submitted by students using the ArtistWorks Video Exchange Learning® platform. Chuck reviewed each submission and recorded a video response, offering specific guidance to the student to take their guitar playing to the next level. All students can access the Video Exchange library and watch these interactions with Chuck. This library is comprehensive and may contain the key to unlock your playing. 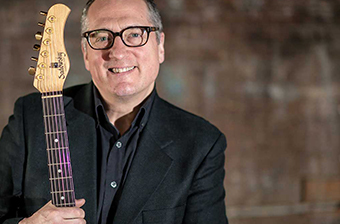 Chuck Loeb was a versatile composer, arranger and producer with a passion for jazz guitar. He was exposed to jazz through fusion music of the early 70s and his influences included Wes Montgomery, George Benson, John McLaughlin and Pat Martino. He played with jazz luminaries like Chico Hamilton, Ray Barreto, Hubert Laws, and many others during his career and became the musical director and composer for the Stan Getz band in 1979. A renowned soloist, his 1996 solo release "The Music Inside" held the number one position on the contemporary jazz charts for six weeks. He was a member of the Bob James led group Fourplay from 2010 until he passed away from cancer in 2017.